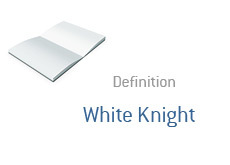 White Knight - What Does It Mean? What is a "white knight"? What is the definition of a "white knight"? A "white knight" is a "friendly" investor or company that attempts to take over a company at the request of management in order to fend off an undesirable "black knight" (or unfriendly bidder). Remember the movie "Wall Street"? I'm sure you do. At the end of the movie, Sir Lawrence Wildman is approached by Bud Fox and various union representatives to be a "white knight" for Bluestar Airlines. Fox and his co-conspirators wish to keep the company out of the hands of Gordon Gekko (the black knight), because Gekko plans on dismantling the company if he is successful in his takeover attempt. The union representatives agree to concessions to make the deal work, and Wildman launches a bid for the company. This is a perfect (although fictional) example of a "white knight". The management of Bluestar Airlines wanted to keep the company out of Gekko's hands, so they approached Sir Lawrence Wildman to be a white knight. In order to grab Wildman's attention, union representatives at Bluestar agreed to concessions that they weren't willing to offer to Gekko. The most powerful weapon in the arsenal of a "black knight" when dealing with a "white knight" is a higher bid. Management has a fiduciary duty to consider all bids, and shareholders may go with the higher bid of a "black knight" even if it's not in the best interests of the people working at the company. Money is money, and many shareholders will simply vote for the strongest bid with the best terms.